Return to the cities of Rapture and Columbia and experience the award-winning BioShock franchise like never before, beautifully remastered. 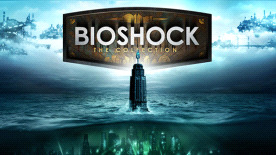 BioShock: The Collection contains all single-player content from BioShock, BioShock 2, and BioShock Infinite, all single-player add-on content, the “Columbia’s Finest” pack, and Director’s Commentary: Imagining BioShock, featuring Ken Levine and Shawn Robertson. • BioShock main game and all single player DLC. • BioShock 2 main game and all single player DLC. • BioShock Infinite main game and all single player DLC. LEGAL: ©2016 Take-Two Interactive Software, Inc. and its subsidiaries. Take-Two Interactive, BioShock, BioShock Infinite, 2K, Irrational Games, and respective logos are all registered trademarks or trademarks of Take-Two Interactive Software, Inc. All rights reserved. EULA: ©2016 Take-Two Interactive Software, Inc. and its subsidiaries. Take-Two Interactive, BioShock, BioShock Infinite, 2K, Irrational Games, and respective logos are all registered trademarks or trademarks of Take-Two Interactive Software, Inc. All rights reserved.